It’s Sunday, June 19. LeBron James collapses to his knees on the floor of Oracle Arena in Oakland, CA. Partly due to overwhelming joy and partly due to exhaustion. LeBron has just defeated the 73-9 Golden State Warriors to win the 2016 NBA Finals. It is his third title but his first as a Cavalier, bringing his hometown of Cleveland a long-awaited championship. After coming back down 3-1 in the series, monstrously swatting Andre Iguodola’s go-ahead layup attempt with 1:51 left in the fourth quarter, and draining a free throw to make it a two possession game following a brutal fall to the Oracle hardwood with 10 seconds left, he was understandably drained. 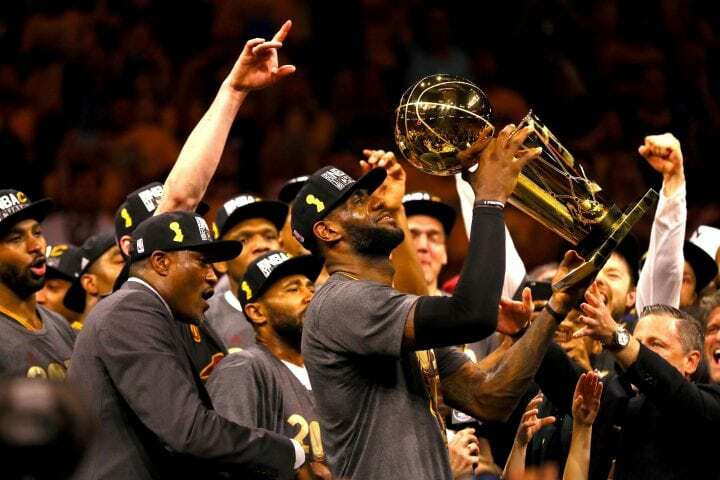 His dream of winning a title in Cleveland recognized, LeBron let out a healthy cry of, “Cleveland, this is for you!” Nearly two years prior, he made the controversial decision to take his talents back to Cleveland and abandon his four year, two-title long run in Miami. 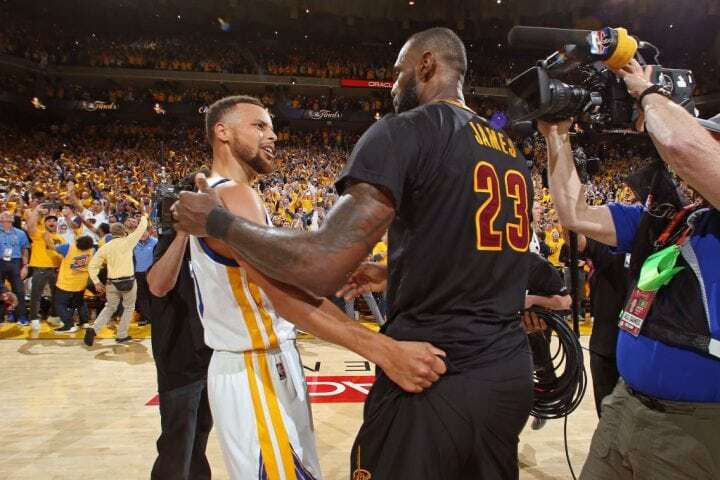 After a bitter loss in six games to Golden State in the previous Finals, here he stood. 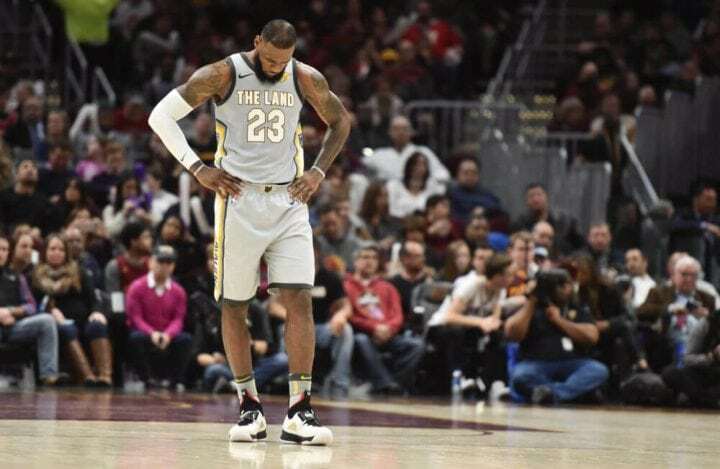 Donned in the black-sleeved Cavs’ alternate uni, he stood as the conqueror of the vaunted record-breaking Warriors, as the super hero Cleveland sports has been waiting for, and as the undisputed king of professional basketball…. .…Fast forward about one year later. The same location, same arena. LeBron James walks off the court and into the locker room as the confetti falls on the 2017 champion Golden State Warriors. Draped in the familiar white and blue, Steph Curry gives his sparring partner Kyrie Irving a hug. Kevin Durant, a newcomer this year, squeezes his mother in absolute euphoria of winning his first championship. Lebron heads to the locker room. The unstoppable Warriors roster with the addition of KD had proven even too much for the King, and he now stood in an entirely different spot. The same black uniform as last year, and the same setting, but this time as a Finals loser. He also stood as a man at a crossroads. A league that has been his for about a decade, seemed to be slipping out of his hands. Though largely recognized as still the best player in the world, he now had to face the daunting reality of life in the Curry/Klay/Draymond/Durant NBA. The King was, at that moment, presumptuously dethroned…. …It felt like LeBron had barely even taken his shooters’ sleeve off when things got even worse. His superstar sidekick was already demanding a ticket out of town. At 25 years of age, all-world point guard Kyrie Irving was seeking a trade. Seemingly tired of living in the mega-shadow of LeBron and unhappy with management, Kyrie was moving on from his days in Cleveland. After a blockbuster trade late in August that sent the all-star packing for Boston, the Cavs in turn received Ante Zizic, Jae Crowder, Isaiah Thomas, and the Brooklyn Nets coveted 2018 first round pick. LeBron now had some new toys to work with, but there truly is no replacing Kyrie Irving. His transcendent ball-handling ability, his lethal shooting stroke, and his proven playoff dominance make him absolutely one-of-a-kind. But Cleveland received about as good a consolation prize as they could have hoped for at the time. Jae Crowder had proven to be a solid two-way threat who was one of the better wing defenders in all of basketball. Isaiah Thomas had just put up a dazzling near-30 point-per-game 2017 campaign, that resulted in his being named to the All-Star team again, finishing among the top 5 for MVP talks, and his Celtics reaching the NBA Eastern Conference finals where they would lose to the same Cavaliers squad. Along with a very promising Nets draft pick on the horizon, things didn’t end up as bad as it seemed like they were going to when their malcontent All-Star forced his departure. And after signing LeBron’s former championship co-star and indisputable future hall of famer Dwayne Wade, hopes remained relatively high. All of these pieces though, didn’t add up to the 2016 championship team. With Isaiah Thomas out indefinitely due to a knee injury to start the 2017-18 season, LeBron and the Cavs embarked on life without Kyrie. Calling the season a disappointment would be putting it lightly. Thomas wouldn’t debut until January. This left aging and injury battered Derrick Rose to take his spot at the point. The former MVP proved to be a shell of his former dominant self and would only last until November before the all-too-familiar injury bug got him again. His left ankle sprained, he would never return consistently to the starting lineup. Injuries weren’t the only thing that plagued them. New addition Jae Crowder was struggling to make any kind of significant impact, with his three-point percentage dipping down around 32-33% from the near 40% he shot his previous year in Boston. His rebounds per game dropped from 5.8 to 3.3 and his points per game dropped from 13.9 to 8.6. Dwayne Wade would prove largely ineffective as he averaged a mere 11.2 points per game and was only being trusted with 23.2% of the minutes per game. Even once Isaiah Thomas returned, he was far from his all-star form. Thomas’ ball-dominant style clashed badly with an offense that had to start or end with the ball in James’ hands. His three-point percentage was at 25.3%. Considering the 37.9% he shot from three last year, this is stunning. He also went from averaging 28.9 points per game to averaging a vastly underwhelming 14.7. His efficiency was a disaster, as the 27.1 minutes he averaged per game on the floor only resulted in his making 36.1% of his shots. Compared to the 46.3% field goal percentage in Boston the previous season, this was disconcerting. Now, of course any time you join a team with the greatest basketball player in the world, you’ll take at least some hit in numbers. But Thomas wasn’t brought in to be a role guy on a good team. He was brought in to replace Kyrie Irving, and to be a borderline co-star with the King. He was expected to be the clear number 2 scorer and to help LeBron bring Cleveland back to the finals. Instead, he became nothing but a defensive liability and point guard who struggled to produce without the benefit of Coach Brad Stevens’ system. Stevens’ system allowed him to consistently come off one or even two picks at a time to get to the bucket for a layup, dump-off, or kick out pass. When he wasn’t starting the play, he was often able to come off screens for a catch and shoot which he mastered in his tenure with the C’s. Now, he was having all kinds of trouble adjusting to a system in which he was catering to a primary option that was not him. …. 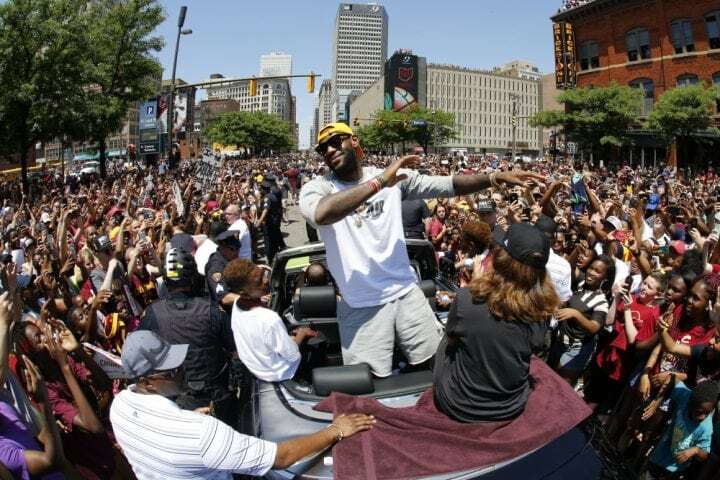 LeBron celebrates the championship parade in Cleveland. It’s a warm sunny day on the 22nd of June 2016. LeBron is smiling ear-to-ear. J.R. Smith’s shirt is off… still. Coach Tyronn Lue dances to the popular hip-hop song F*uck up some Commas by rap superstar Future. Veterans Mo Williams, Richard Jefferson, and Channing Frye bask in the glow of a long-awaited championship. 2-guard perimeter defending specialist Iman Shumpert joins J.R. Smith and is now shirtless as well. All-star power forward Kevin Love sits holding two WWE championship belts over his shoulder. The city of Cleveland is on cloud nine, 10, and 11. It is undoubtedly the greatest sports celebration in the city’s history. Mired in the constant heartbreak and losing of the NFL franchise Cleveland Browns along with the MLB franchise Cleveland Indians, Northeast Ohio had been waiting generations for this celebration. In the center of it all, is their transcendent superstar. 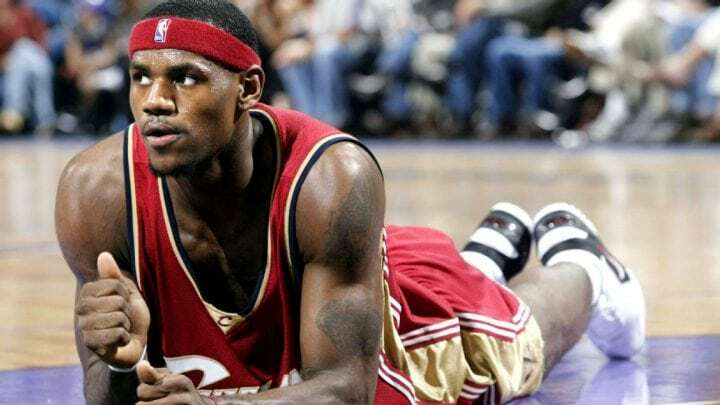 Since the Cavs drafted him in 2003 with the number one overall pick, LeBron has been viewed as the Heir apparent to Michael Jordan. Between his decision to don Jordan’s mythical number 23, his nickname of “The King”, and his frightening basketball abilities at such a young age, the comparisons between the two make sense. This has come with unprecedented scrutiny as well though. Unfortunately for him, moments like his loss to the Celtics in the 2010 semi-finals, “the decision” to take his talents to South Beach, and his no-show in the deciding game 6 of the 2011 NBA Finals, have all become etched in his lore. They are moments that sports fans that grew up during that time period will never forget. Though he probably wishes they would. As for me, I remember where I was for all three. At the same time he has produced some of the most staggering statistics, generated some of the gaudiest of accomplishments, and become the undisputed center of the Basketball world for a little over a decade. He has been to seven straight finals, completely owned the entire eastern conference for years and years, and has done it with nothing but class and integrity (save for “the decision”). He is as polarizing as he is talented. ESPN, fans, newspapers, and social media have been infatuated with the on-going story line of LeBron’s career and his attempt to chase MJ. From 2003-2018, the NBA has used this angle to generate revenue, sales, and attention. And it has worked like a charm. LeBron is the center of the sports world at all times, and this is something we have not seen since… well, probably Jordan. Let’s fast forward back to the middle of the 2017-2018 NBA season. Right back to the 31-22 Cavs. It was hard to imagine that the franchise would sink so low back in the summer of 2016. But here they stood in 2018, at LeBron’s lowest point since returning to Cleveland. With the trade deadline quickly approaching, there were many calls for a change. On Feb. 8 right before the trade deadline, the Cavs decided to totally revamp their roster. They unloaded the aging Dwayne Wade, trading him back to Miami for a second round pick. They were also involved in a three-way trade, which sent Iman Shumpert packing for Sacramento, and Derrick Rose and Jae Crowder to Utah. In return they received Rodney Hood from the Jazz, a very talented young perimeter scorer, as well as George Hill from the Kings, a well-respected veteran point guard who can knock down threes. 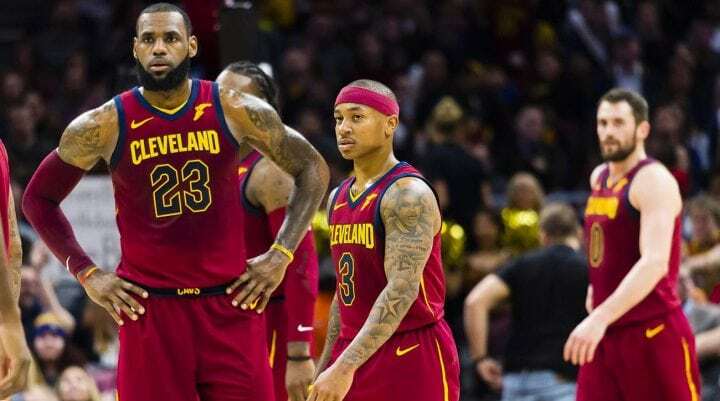 They rid themselves of Isaiah Thomas, despite the pre-season hopes that he would be LeBron’s wingman. Now, he was off to LA to play for the Lakers. In return they received point guard Jordan Clarkson, and power forward Larry Nance. The hope was that Clarkson could be a solid backup point to Hill, while Nance could help increase their versatility by switching between the 4 and an undersized 5 position. When the trades were made, the hope was that Cleveland could catch the Raptors for the 2 spot and maybe even catch the C’s at 1. Though the moves did inject some life into the team as they trounced Boston in their first game together, after starting hot, they finished only 19-10. In the fourth spot. Not exactly what they had hoped for. So… now what for LeBron? The Cavs will go up against a formidable Indiana Pacers squad led by all-star standout Victor Oladipo in the first round. They are the favorites, as they should be. But these playoffs appear to be a bit different from what LeBron is used to. Normally his team is far and away the best team in the Eastern Conference, and bulldoze through the playoffs. This year, at the four seed, it is a little different. The injuries to Kyrie Irving and Gordon Hayward all but eliminate the Celtics from any kind of serious run already. That helps the King. But a star studded young team in Philly appears to be a massive threat. With possibly the best center in the NBA in Joel Embiid, and the probable Rookie of the Year in Ben Simmons, along with finishing the season with 17 straight wins, they seem primed for the moment. Joel Embiid has had to miss time with a facial fracture, but it seems he will be ready for the second round, if not most of the first. The Sixers aren’t the only eastern conference team they should be worried about. With the second best record in the entire NBA at 59-23, the Toronto Raptors may have their best opportunity to finally reach the NBA Finals. Perennial All-Star guards Kyle Lowry and Demar Derozan lead a team that has all the talent to win it all. They can shoot, they can defend, they can pass, and coach Dwane Casey maximizes every inch of talent they have out there from night to night. They have rolled through the regular season, and are more than just a threat. And even if The King can somehow get past all of that and reach the Finals, he faces the possibility of going up against the dominant Houston Rockets, or the battle tested (and dominant while healthy) Golden State Warriors. Whether he has to battle the probable MVP of the league in James Harden and his co-star Chris Paul, or the Warriors led by the historic combination of Klay, Draymond, Steph, and Durant, it will be an absolutely daunting task. To say the least. LeBron now faces what appears to be most likely his biggest challenge yet. That isn’t to say that he hasn’t had worse teams. He has, for the first seven years of his career. And this isn’t to say that this is the most scrutiny and pressure he has had to deal with. It isn’t. Not by a long shot. That also isn’t to say that he hasn’t faced tougher opponents before. He has. San Antonio, Oklahoma City, and the 73-9 Warriors own that designation. But these playoffs are unique for him, as this is the first time since his original go ‘round in Cleveland that he doesn’t have a transcendent superstar on his team with him. Kevin Love is a fantastic rebounder on the block and shooting threat from deep. He has been to several all-star games and has put up gaudy numbers in the past… but he isn’t Kyrie or Dwayne Wade. LeBron has to do something that Michael Jordan has never had to do. Carry a team that has no business being in the finals, to the finals. And somehow win when he gets there. Despite having the most lackluster team around him that he has had in close to a decade, he is attempting to carry them through the east and then through a fantastic team down south in Houston or out west in Oakland. It is unlikely… but if he does it, there is a very good chance that it goes down as the most improbable accomplishment in basketball history. That is not hyperbole. Think of it this way; Bird was never expected to do this. He always had Parish, McHale, and even Dennis Johnson who was a hall of famer. Magic was never expected to do this. He always had Kareem, Worthy, and hall of fame coach Pat Riley. And yes, even Michael Jordan was never expected to do this. He always had legendary coach Phil Jackson on the sidelines and hall of famer Scottie Pippen at forward. Each one of all those greats’ teams were never as lacking in talent as LeBron’s, and it isn’t even close. If LeBron carries a team in which Rodney Hood is most likely the third best player on the roster (or maybe George Hill), it will be hard to argue against him for the greatest of all time. He would have four NBA titles, nine finals appearances, four MVP’s, and countless frightening statistics. He would also have upset the 73-9 Warriors by coming back down 3-1, and would also have carried a historically underwhelming team to a world championship. Again, all of this is extremely unlikely. The Cavs awful defense should have no way of stopping the on slot of Simmons and Embiid, or Lowry and Derozan. Their offense relies too heavily on LeBron, and they have very little experience together. Their fluidity has not fully developed yet, and it is clear that Rodney Hood has not been the perimeter threat that they hoped and needed. Coach Tyronn Lue has had to take weeks off for health related reasons, and the chemistry of the team seems to be subpar at best. All that being said… what if he does it? 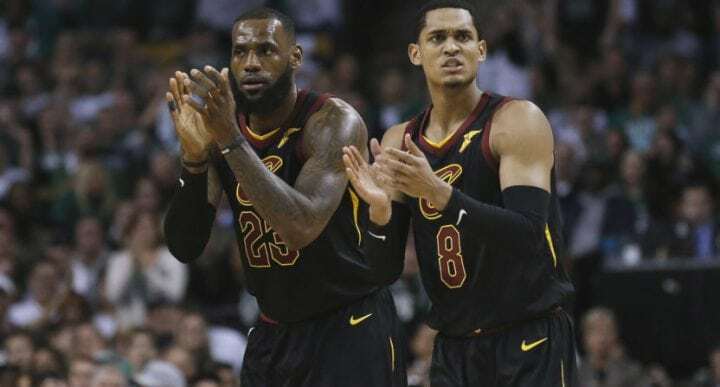 What if LeBron carries this 2017-2018 Cleveland Cavaliers to a championship? That may solidify his argument as the “GOAT.” The image of LeBron celebrating this championship could rival the footage of MJ crying holding his first finals trophy, or the image of Magic leaping in the air after upsetting the Sixers while starting at center in his rookie year. It could be the best fairy tale story the NBA has ever had. And it will take maybe the most impressive performance the NBA has ever had. But if someone can do it, it’s the King. So, is this actually LeBron’s greatest challenge yet? I’d say so, but that is all subjective. There are a myriad of different instances in which you could argue that his challenge was much steeper. You could tell me that going up against Tim Duncan and Gregg Poppovich in just his fourth season at the age of 22 was. It makes sense, but I would say to you that no one really expected ‘Bron to win anyway. You could say his game six against Dallas in the 2010 NBA finals was. It makes sense, but I would say that despite the pressure, LeBron’s team was absolutely better and should’ve won. It shouldn’t have been the challenge it ended up being for him. You could absolutely make the argument that coming back from a 3-1 deficit against the record breaking Golden State Warriors was. That makes total sense, but at the end of the day he had Kyrie Irving by his side, an unstoppable force at point guard. He does not have remotely that level of talent around him now. Whether or not this is actually his biggest challenge yet cannot be definitively answered. But regardless, with the playoffs kicking off, he is embarking on what is indisputably a remarkably implausible journey. If he pulls it off though, be prepared to hear a lot about LeBron James being the greatest basketball player in the history of the world. Because if it happens, he probably is.